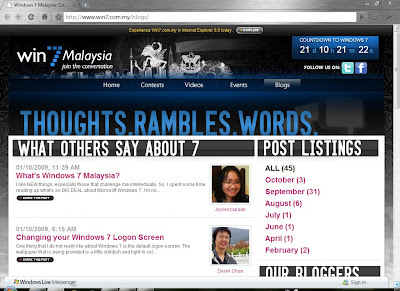 For your daily doses of Windows 7 Malaysia, check out What Others Say About 7. Here's my first post about Windows 7 Malaysia: What's Windows 7 Malaysia? Moving forward, I shall share more about how I'm Win7-ed, Se7en-fied, etc. Win 7 for the WIN! For Twitterers, check out what others tweet about Windows 7 Malaysia live stream here. Visit win7.com.my, right click on the Silverlight Twitter feed application, and install it to your machine to easily monitor the feed. See screenshot below to view how the feed application will look like. Why? Well, by doing this, you stand the chance to win yourself a copy of Windows 7 Ultimate when you're participating in Windows 7 Malaysia's Ultimate Re-Tweet Contest! For more details plus terms & conditions about the contest, click "What's Hot?" when you're on the site. Have loads and loads of fun!!! se7venified lols eh, laptop upgrade di?